"A quick, easy and mouth-watering zucchini recipe. The sesame imparts intense flavor which combines deliciously with the Parmesan and seasonings. Cayenne pepper adds a little kick for those who like some spice in their side dishes." In a large bowl, toss the zucchini with the olive oil, sesame oil, sesame seeds, Parmesan cheese, cayenne pepper, and garlic salt. Spread in a single layer on a baking sheet. Bake 20 minutes in the preheated oven, until lightly browned. Kind of bland in my opinion. When I reheated the leftovers in the oven the next day I added another few tablespoons of parmesan cheese and that helped. 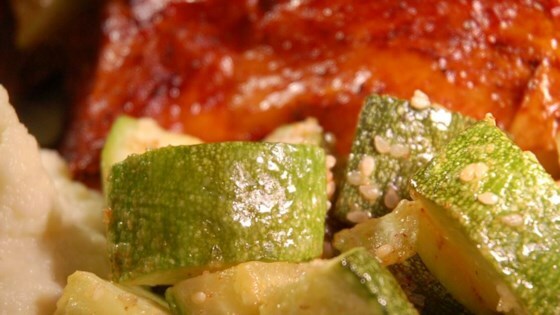 the zucchini was flavorful and easy to make. i used 2 zucchinis and the oil was a little much, so i'd cut back a lot on the oil next time.